View the Reunion I weekend program. View the Reunion II weekend program. A note about on-campus housing: Due to a limited number of rooms available on-campus, alumnae registering on or after May 7, 2018 will be placed in a 4th floor room in a house with no elevator and no air conditioning, and may not be housed with their class. Alumnae may still register for Reunion without purchasing on-campus accommodations. Reunion I online registration will be closing at 11:59 p.m. on Thursday, May 10th. Walk-ins will need to stop by the registration tent at the Alumnae House when they arrive on campus, and will be able to register for meals and housing on a space-available basis only. Reunion II online registration will be closing at 11:59 p.m. on Thursday, May 17th. Menus and meals details are available here. After April 27, meal prices will go up $10 per adult per meal. Children’s meal prices will remain the same. Classes of ’38, ’43, ’48, ’53 are guests of the college. All refund requests will be reviewed and processed following the completion of Reunion II weekend (May 27). Please allow up to four weeks after Reunion II weekend for receipt of your refund. Events that are open to the public are regularly scheduled in wheelchair accessible locations to the greatest extent possible. If you wish to attend a specific event and want to confirm accessibility or make a request for specific accommodations, please contact the Office of Alumnae Relations or contact the Office of Disability Services. 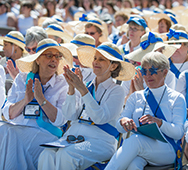 Over 1,950 alumnae attended Reunion 2017.